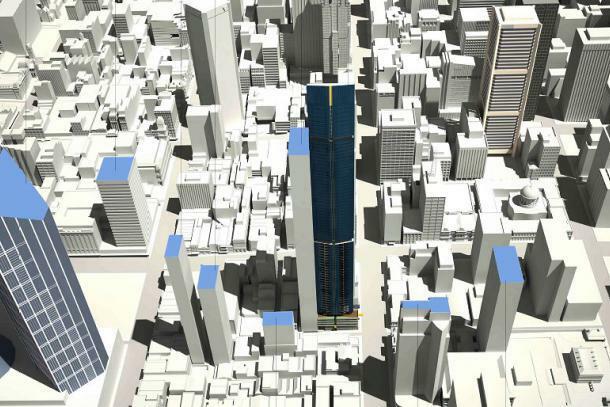 Developer Brady Group’s development application plans for a new 254m high tower in the Melbourne CBD have been unveiled. The proposed development would be located on a prime 1,290sqm site at 280 Queen Street and comprise an 80-level mixed-use tower. Designed by Peddle Thorp Architects, the development would offer 589 one and two bedroom apartments, 23 penthouses and one custom designed penthouse. The split-level custom penthouse would be located over levels 76/77, with the lower floor containing 290.2sqm of internal space, while the upper floor would contain 265.6sqm. The development would also include 1,400.2sqm of office space through the podium, 322.4sqm of retail space, 504sqm of communal facilities and 130 basement car parking spaces. Brady Group lodged the development application with council last October.